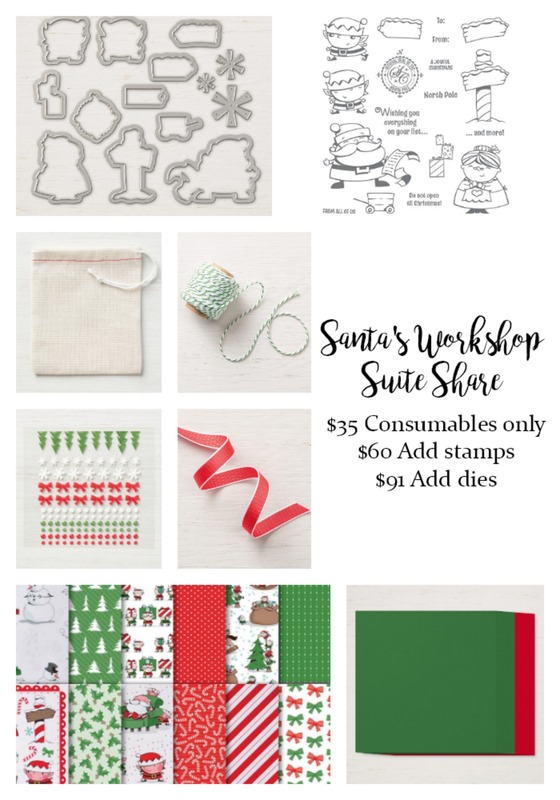 One of my favorite things about Stampin’ Up! 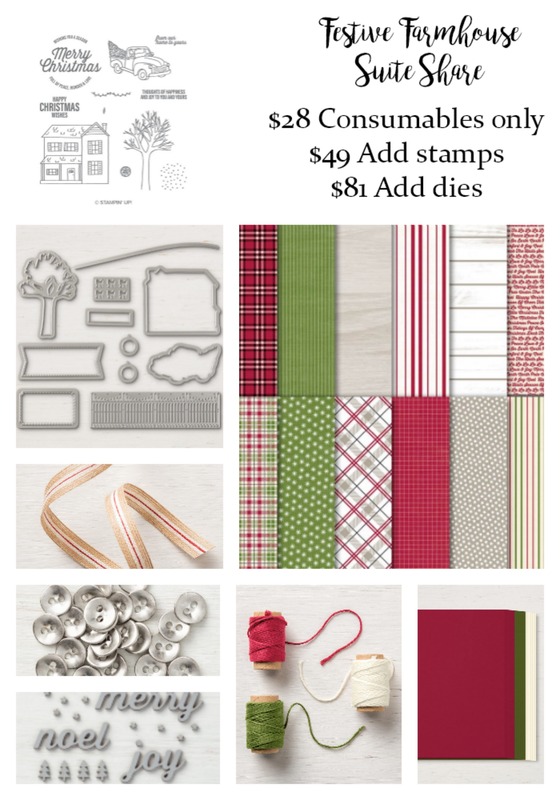 is the amazing product coordination – stamps and punches, dies and designer series paper, ribbon and ink. 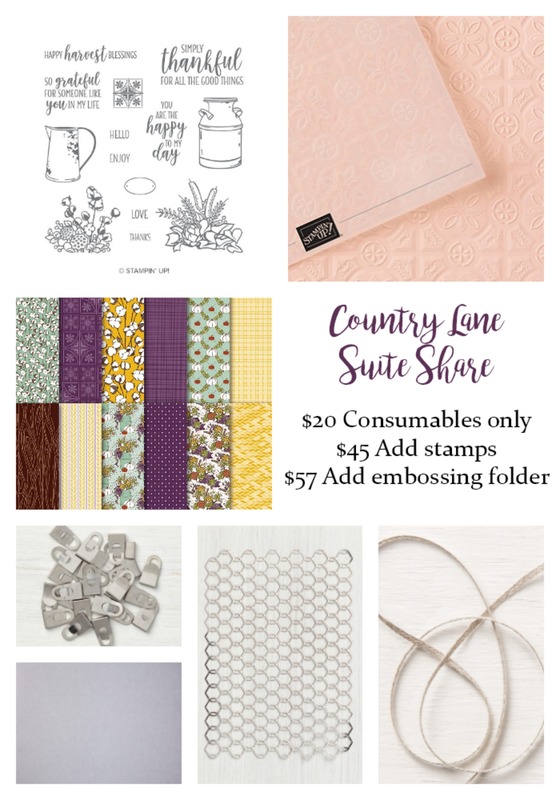 And the Suites in each catalog are groups of products that all work together to make your cardmaking and scrapbooking nearly effortless. 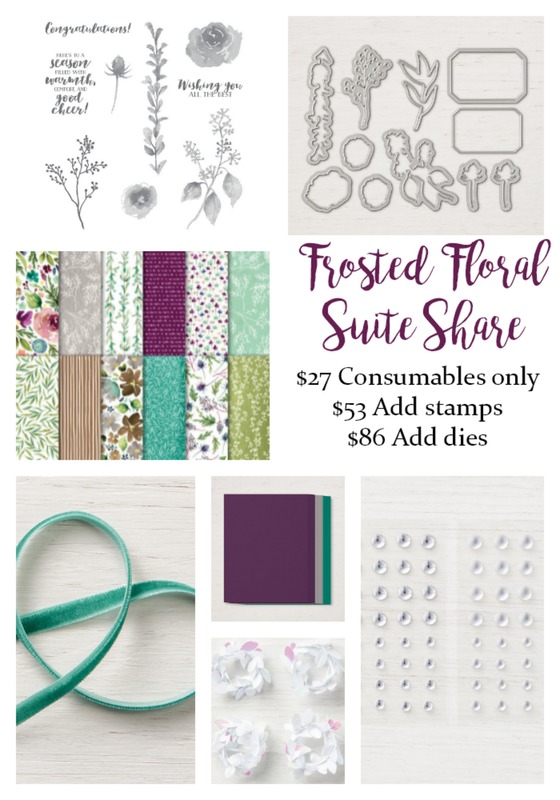 You may want to buy a full Suite of matching products but may not want to buy full packs of paper and cardstock or full rolls of ribbon. Perhaps you need less of each Suite. That’s where my Suite Shares come in. These Suite Shares are for people in the U.S. only; demonstrators are welcome. The lists below show the prices of each Suite Share and lists of what all is included. As you go through the Holiday Catalog, pay close attention to the first pages in each of the seven Suites. 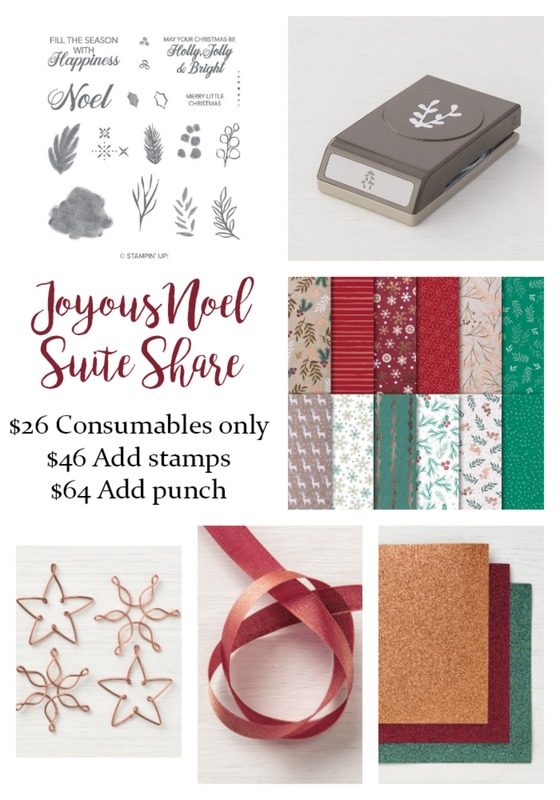 The first stamp set, plus the consumables (paper, ribbon, buttons, the single use items) on the same or next page are included in the Suite Share. Note that if there is a choice between wood-mount and clear-mount, the clear-mount stamps are included. You can replace these with the wood-mount option. I will let you know the price difference. 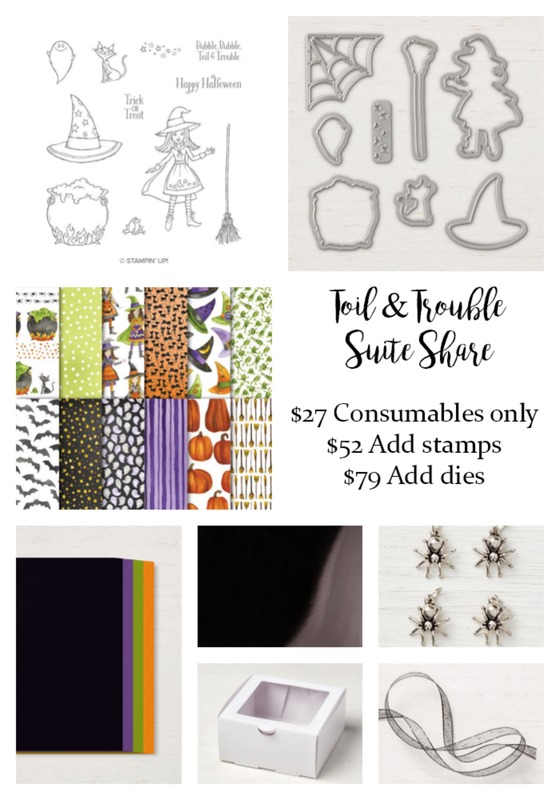 There is also a bundle option where you can add the coordinating dies or punch in the bundle, and there is a consumables-only option where you can exclude the stamp set. Pricing does not include $7 priority shipping; if you order more than one Suite Share, I will combine shipping so you get the lowest shipping cost possible. If you order more than two shares, your shipping may go up, depending on how much I can fit into the padded priority envelope. Each share will be two people. 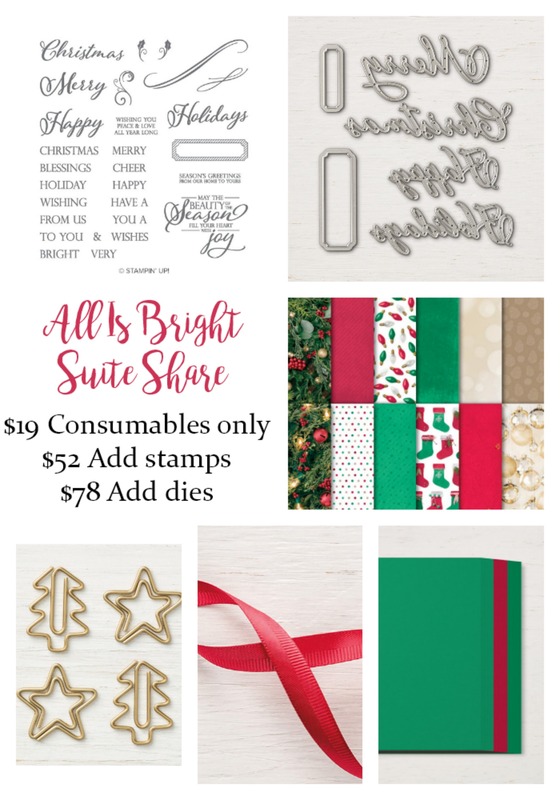 Each person will receive their own stamp set and half of each of the consumables mentioned above (plus coordinating dies, punch, or embossing folder and/or minus stamp set, depending on which option you choose). When a share is full (i.e., two people have signed up), I will contact you for payment, so make sure you give me a good email address that you check regularly. Payment is required before I order the products, and you can pay through either Paypal or Square (I bill through Paypal by default -- indicate in the comments if you prefer Square). You will not pay until your share is full. When a share fills up and everyone has paid (or September 5, whichever comes later), I will order all of the products the same day, divide it up as soon as I receive it, and ship it out via Priority Mail as soon as it’s ready. Expect a 2-week turnaround after the share fills up, longer if the share is full on or before the first week of September, as shipping will likely be delayed. And remember, I can’t order any of the share products until the catalog is available to customers on September 5. When one share fills up, I will open a new one. I will keep in contact with you if there are backorders so you know what to expect. Fill out the form below and click the check boxes indicating which shares you are signing up for.